I’ve always been fascinated with scary things. Or, more accurately, how people can find entertainment value in scary things. To be fair, as a child, I tried to get into mildly scary literature, like Goosebumps and Fear Street, but no matter how hard I tried, they were still books that I’d have to read at noon, while bathed in bright sunlight, and sitting with my back against a wall. And don’t even get me started on how long it took me to watch The Sixth Sense. Okay, fine. It took me two tries, as I had to leave the theatre the first time, due to my chicken-ness. Also, I once had a nightmare after reading the back of a movie in Blockbuster. Did I mention I was 20 at the time? So because I'm such a scardy-cat, why am I reviewing a collection of horror short stories? Well, the short answer is that I was tricked. You see, the author, Suzy G, is a Twitter pal. For the last couple of years, we’ve chatted about writing-related things, Elaine’s fly dance moves, and, of course, nail polish (or, to be more accurate, Suzy’s lack of fun nail polish). So when I saw that Suzy had released a collection of short stories on Amazon, I rushed right over and bought them. Sure, there was a creepy-ish cover, and the title didn’t exactly say Triumphant Tales of Unicorn Kisses, but Suzy was FUNNY on Twitter, so I dove right on into the first tale, eager to read what Suzy had written. It was within that first page that I suspected something was amiss. Then, things quickly took a turn into Terrifying Town. I knew that I should put it down—that my overactive imagination wouldn’t be able to handle the eeriness, but stupid Suzy G and her stupid engaging writing held me captive. Not only that, but the second I was finished the first tale, my finger involuntarily flipped to the first page of the next story, like it was possessed. Like it wasn’t even my finger. My eyes betrayed me as well, as they simply refused to stop reading. It was all just so creepy—so vivid and strange—that I had to keep going. And then, just when I’d forgotten that I was supposed to be scared because I was so invested in what was going to happen next, the story would end! It was so mean of Suzy G to write short stories, guys—SO MEAN! The characters were layered and dynamic and the plots/premises were so creepily unexpected that it left me feeling all stabby when I reached the end of each tale. It was like getting one scoop of Lucky Charms and then having the rest of the bowl taken away. Which I guess is good, considering they’re short stories but GAH! How was she able to get me so invested in so few pages!? It shouldn’t be possible, people. Seriously. I’m a writer, so you can trust me when I say that it’s just plain unfair how much talent Suzy G has. So here’s the deal: you need to read Tragic Tales of Strange Girls, Volume One. If you love scary things, you’ll think it’s the most creep-tastic collection of short stories you’ve ever read. If you don’t like scary things, you’ll still think it’s the best creep-tastic collection of short stories you’ve ever read. 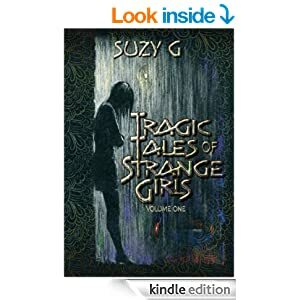 Basically, if you like reading at all, you need to read Tragic Tales of Strange Girls, Volume One. But, uh, when you do, you’ll probably want to sleep with the light on. And with a bat within arm’s reach. Also, a few cloves of garlic under your pillow probably wouldn’t hurt. You know, just to be safe. You’ve been warned. And to learn more about the awesomeness that is Suzy G, make sure to check out the author interview I'll be posting on Wednesday, next week! YAY for getting to know the authors behind amazing books! Thanks to Heather for hosting!